I have visited this stunning luxury hotel only once in my entire Cambridge life and I always forget this fantastic venue for a central meet up location with free parking every time I make City arrangements. I really shouldn’t (and won’t from now on) forget this hotel for most occasions I’m in need of impressing my acquaintances. 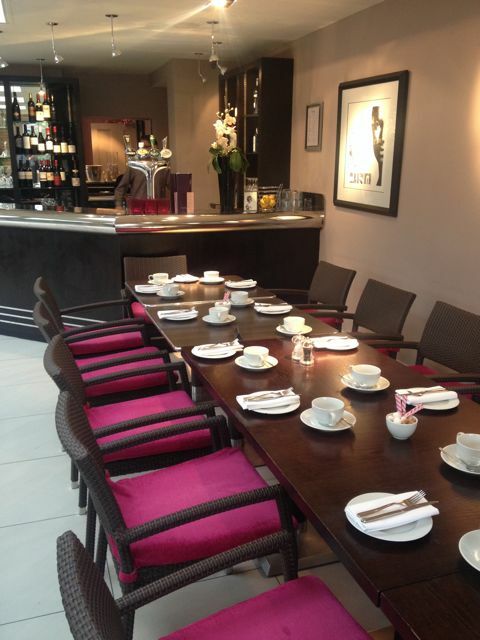 Hotel Felix is located just off Huntingdon Road in Cambridge and is tucked away in to peaceful area, surrounded by greenery and simple decor to help you forget that you in the centre of Cambridge for a few hours. My one and only visit was a good two or three years ago for afternoon tea, of which we fought off the wasps in the garden and ended up sitting inside within the colourful and Art Deco styled conservatory. This is where my recent table had also been reserved for myself and my guest (my lovely mum, who deserved the rare treat!) to sit and relax during a chilly Friday afternoon in January. Hotel Felix is an old Victorian style hotel, infused with modern artwork and a contemporary design throughout. It offers luxury accommodation, a fine dining restaurant (the Graffiti Restaurant) and it’s the perfect venue for an intimate meeting, even a wedding or special celebration. The spacious grounds surrounding this hotel offer a relaxing and al fresco dining option in the warmer months and it’s a great place simply for a coffee over business. No matter what the reason for your visit, the team are friendly and welcoming and nothing is too much effort. On arrival, we were greeted by a suited lady at the reception desk who came around to the front of the desk and took our coats, a very welcome service. We immediately felt at home and she seamlessly handed us a numbered card for coat collection later on as she led us to to the restaurant and handed us over professionally to the team in here. We were seated in the conservatory, of which offers a beautiful and natural light over it’s modern artwork and simplistic tables, both high and low with colourful & comfortable chairs and sofas for a more relaxed dining experience. Our waitress for the afternoon was professional, well dressed and flashed a genuine smile throughout the afternoon. What I loved most about the service here was that it wasn’t rushed, we were given 10 minutes to read through the extensive afternoon tea menu to decide on what we fancied and then our tea & coffee was delivered quick-sharp. This is a venue that doesn’t hassle you with pleas of “Is everything ok?”, “Are you enjoying your food?”, “What do you think of our food?”… We were asked once during the middle of the afternoon, but left in peace for the rest of our stay. This is very important to me, I truly dislike being asked if everything is alright for the third time whilst trying to nod through a mouthful of finger sandwich or a slurp of my tea – if I’m unhappy, I will make it known, as I am sure anyone would. The afternoon tea arrived 10 minutes after ordering and the freshly baked scent awoke our senses before it was even nestled in front of us on the low table. Our waitress went through the tier and explained all the treats to us, a welcome addition as not all establishments offer this and you are sometimes left guessing as to what you are nibbling on. My mum was in fact my dining partner for today, she deserved the treat and it was a superb place to take her, she loved every moment of it. She was stupidly impressed with her filter coffee, a huge pot that lasted the entire afternoon and the best cup of coffee she’s had in a long while… coming from a coffee addict, this is quite the commendation. I opted for a lemon & ginger tea, wanting something a little lighter to sip on as I tucked into my rare treat of an afternoon tea tier. The only downside to the tea was that it was “Twinings”… I do prefer a better quality loose leaf tea. I do wish nice hotels would stop serving this poor quality tea selection, it does disappoint the hardy afternoon tea lover, but it wasn’t a bad tasting cuppa, so I can’t really complain about this too much. 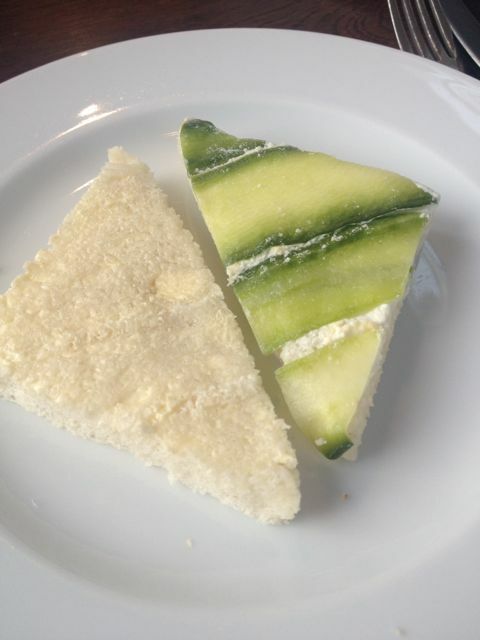 We were offered four different fillings in our dainty finger sandwiches, including egg mayonnaise & watercress, cucumber & cream cheese (with the prettiest strips of cucumber inside I’ve ever seen in a finger sandwich, I loved this little touch! ), ham & sun dried tomato (very sweet and a unique idea, not one I’ve come across before) and a delicious poached salmon – a refreshing option in place of the more “standard” smoked salmon. The next (and most iconic) offerings to tuck into were the large & freshly baked scones with more than our fair share of strawberry jam & clotted cream. The scones were served warm and were so light and fluffy that we both managed to eat both halves (unheard of for me, I usually stick to one and then wander over to the cakes) and these were just faultless. 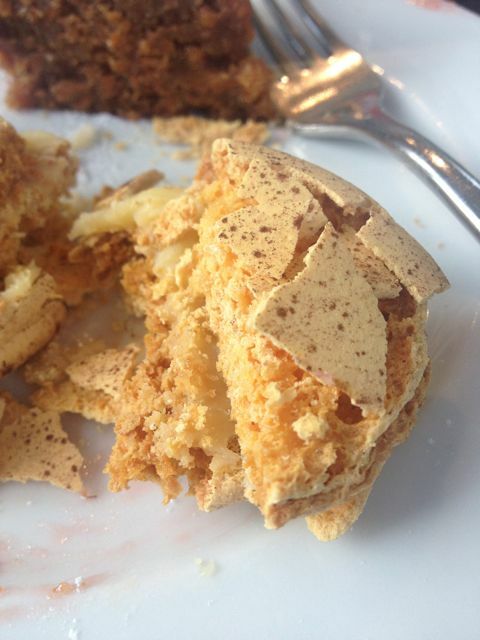 I even managed to teach my mum some “scone etiquette” as we nattered, but she smothered hers regardless… and so did I! The cake selection was extensive and I have to say, I was defeated to a point, so we shared most of the sweet treats on offer so that we could sample a little bit of everything – it was all too tempting to ignore completely. These treats were mainly delicate creations, but not too dainty, there was plenty of it so you certainly wouldn’t go hungry with this tier I can tell you. 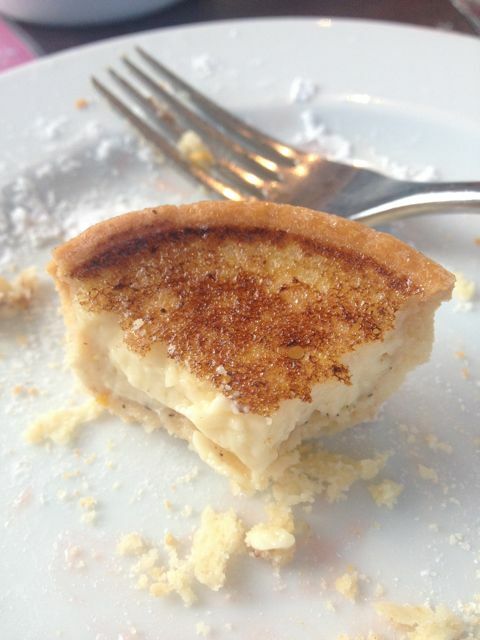 We worked our way through an orange & nutmeg custard tart, with crisp pastry and a smooth and creamy centre, this was my favourite by far. There was a crisp white chocolate & passionfruit macaron with a perfectly soft centre and a beautiful meringue filled with raspberry cream and a dribble of coulis in the centre. It could have done with a little more cream if I were to be picky as it was a fairly dry meringue, but it was a light option in the midst of a hardy cake selection. The carrot cake was extremely moist and needed a cake fork to cut through it’s sticky sponge. It had a slight spiced kick to it and was surprisingly light with an equally fluffy mascarpone cream topping it off perfectly. With a new pastry chef on board, Hotel Felix have upped their game hugely when it comes to their afternoon tea, no dry Battenburg or crumbly eclairs here, gone are those days. They now offer an impressive and indulgent affair and it is truly fantastic value for money, not forgetting the lack of stress about car park charges as you dine, it’s in a perfect location for a City retreat, even if just for an hour or two. I always like to see how a venue fairs on this little query… we had some cakes left over and decided that the manfriend would enjoy them for a midnight feast later on. This venue wrapped my treats into an elegant enough foil envelope and placed them into a brown paper bag for me to carry home. Some venues like to embarrass you by bringing it to the table (very bad etiquette ; ) but this venue left it at the restaurant bar for me to collect on departing, perfect “doggy bag service”. Starched napkins are always welcome when having a nice afternoon tea and these were starched AND linen napkins set at the table for us. 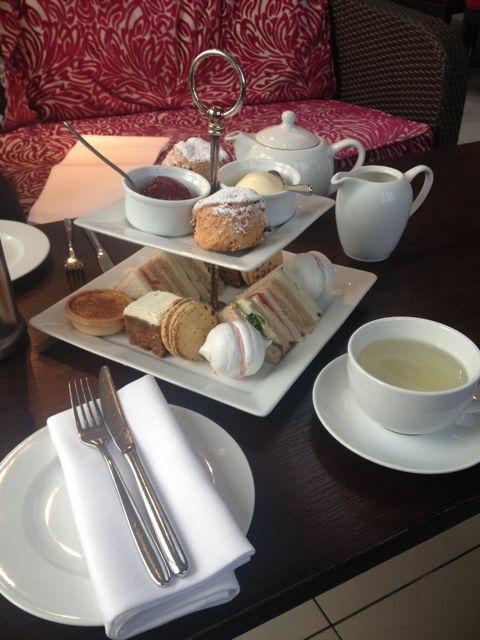 There is nothing worse than a beautiful afternoon tea and paper napkins left for you to rub your mouth with. This is a very well thought out offering and the finer details are taken care of, I’m so pleased about that. As we dined, there was a “Gothic” style wedding photo shoot taking place outside on the patio and within the grounds, it was a very intimate affair and we couldn’t quite work out if it was a real wedding or simply a shoot. Either way, we very much enjoyed watching this lovely couple as we relaxed, this hotel would make the perfect intimate wedding location. If you can’t manage a full on afternoon tea, the menu breaks it down into more manageable options, so you can just go for the finger sandwiches, or simply a scone and a cake selection for a sweet tooth, such a fantastic idea. My pot of tea included a tea bag, of which stewed and gave a very bitter taste to the final cup as I dined. It would be fantastic if the venue could offer a small plate or tea strainer to remove the leaves at your desired strength. The hotel entrance is a little confusing, as there are two ways into the building, one of which takes you to the reception desk and one that leads you through a set of winding corridors and can disorientate a little. On booking an afternoon tea, it could be handy to be provided with directions as to where to make your way to from the main car park, but this is a very small niggle if I had to be picky. There wasn’t enough savoury food to balance out the afternoon tea tier. 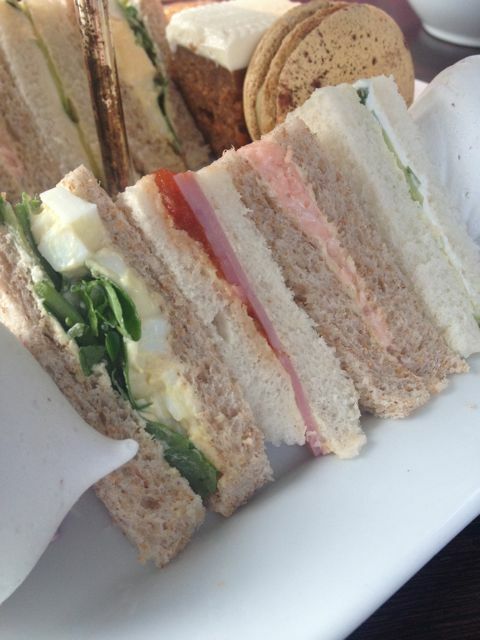 A refresher of finger sandwiches could be offered or another savoury bite or two to balance out the large sweet selection on offer. Afternoon tea at Hotel Felix is served between 2pm to 6pm daily and costs just £15.95 per person for a full afternoon tea. It’s superb value for money and I for one will be heading back there when the opportunity arises. You can view my full photo album for this visit by clicking here. Our daughters friend is off to Cambridge imminently for her doctorate having recently undergone cancer treatment. We would like to buy her afternoon tea vouchers and wondered where you could recommend? She will be reliant on public transport for good old feet. I have read you Felix hotel blog but was not sure how recent it was done and whether it is still recommended or do you have any other suggestions?